We see amazing customer service continue to be a crucial differentiator and that’s why we’ve invested heavily in technologies to improve the responsiveness and quality of the customer experience. 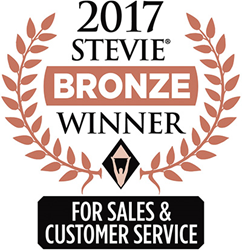 We’re honored to be recognized with a Bronze Stevie Award. SmartLinx Solutions has won a Bronze Stevie® Award in the Innovation in Customer Service - Computer Industries category in the 11th annual Stevie Awards for Sales & Customer Service. The award for “Total Customer Service Modernization” marks the second consecutive year SmartLinx has captured a coveted Stevie Award.